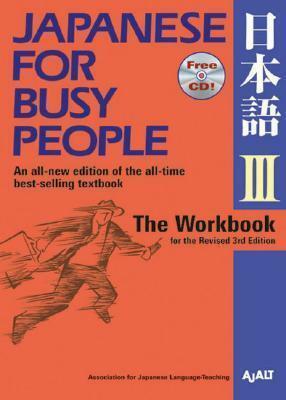 The Workbook for the Revised 3rd Edition of Japanese for Busy People III offers readers longer and more complex reading passages familiarize you with new vocabulary and the conventions used in Japanese writing. It can be used either in tandem with the main text or as a self-study aid. AJALT was recognized as a nonprofit organization by Japans Ministry of Education in 1977. It was established to meet the needs of people who wish to communicate effectively in Japanese. In 1992 AJALT was awarded the Japan Foundation Special Prize. They are the authors of the Japanese for YoungPeople series and Japanese for Professionals.